How to Store Latex Paint? I have about 20 gallons (or partial gallons) of latex paint. I’d like to consolidate some of it, but give most of it away. Habitat for Humanity would be my first choice, unless they insist on using brand new stuff. Most of the paint is stored on wooden shelves in my crawl space, and is therefore exposed to winter temps. (usually above freezing, but last week it never got out of the teens). The cans are also exposed to summertime humidities, which can get as high as 90% RH. So I’m concerned about the shelf life of the paint itself, as well as the potential for the metal cans to rust. A few of the cans are stored in my shop, which has enough climate control for me not to worry, except for exceeding the paint’s shelf life. I’ve been saving half-gallon plastic jars, and have already used some of them to store partial quantities. They’re #1 PETE, so I’m not worried about the paint attacking the plastic (although maybe I should be). Besides the size reduction, these are helpful because you can readily see the color of the paint. For full gallons in metal cans, I’m considering buying new, non-metal cans, but I haven’t done the legwork to see where these are sold. The more full they are, the better when it comes to storage. Also, I store gallons upside down so any small cracks in the seal of a closed gallon can are quickly filled w/ paint. If that makes you nervous, at least turn them upside down and give a shake once, so paint can seal the lid in place a bit. Rotate them every year if you’re serious about keeping them long-term (10+ years). Definitely avoid freezing. That cuts the probability of it being useable quite a bit, in my experience. I’ve not had luck with shelf paint more than 10 years old, plus or minus, but having some for touchups has saved me quite a bit of aggravation. 1) storing paint in less-than-full containers. My response to this is using a nitrogen spray to “inert” the head space. Even my unused, unopened cans are useless because they exceed the 5-year shelf life stated. But here’s another way of looking at it: For a 50-year-old house which has never been repainted, isn’t somewhat-degraded paint better for the occupants than no repainting at all? Especially houses built during WWII, whose paint probably contains lead? The problem I always have with storing latex paint is having the can rust. This is not a cheap solution, but one that has worked very well for me. 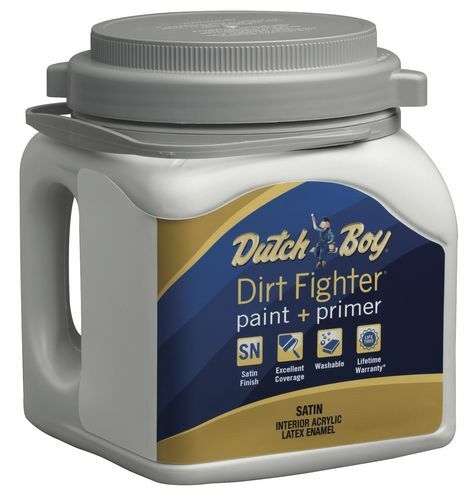 I do not use Dutch Boy paint (Menards) but it comes in great plastic containers. They have a handle grip, interior pouring spout, and seal very well. You can buy empties (gallons and pints) at Menards. When I have enough paint left over after a project to save I transfer it to one of the plastic containers. They seal so well that the paint always stays fresh and there is no issue of rust. Never an issue of getting to lid off either. my local landfill is run by Waste Management and they are deeply committed in recycling everything they can. two days a month, they have free drop off for any and all hazardous paints and cleaners. 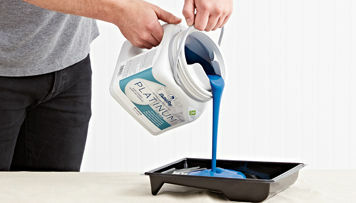 99% of everything related to paints and coatings are recycled in one way or another. so that would be my first choice. after it turns into a rock, toss it in your regular trash for the landfill. local Salvation Army, Good Will or Habitat stores – only new unopened cans. as for Habitat recycling paint, you would have to call them for guidance on that. Each area is probably different. hope you find some way safe to decrease your stockpile. My county landfill will take any paint. When I asked what they did with it, they said they mix it all together in large latex or oil batches and sell it. such stuff and how they mixed discarded paint was very interesting to watch. the latex paint into a 55 gallon drum then works on the color. to whoever needs it or donated to facilities such as Habitat projects. – - – Nothing goes to waste !! I saw that Dirty Jobs show. The recycling paint part was very good. Our local hazardous waste disposal will not take latex paint and the recycling center doesn’t either. They instruct you to do just about what John said, but to use kitty litter. I have cats so there is an endless supply! It does make the paint set up well and then it can go to the landfill. On a somewhat related topic, a source for cheap paint, if you are colorblind or just don’t give a damn, is the “mistakes” area at the big box store. They occasionally goof or someone asks for paint and then walks off. The tinted paint sells for a fraction of the usual cost. One tip I use is to label the date on a piece of tape on the container as soon as I get home. If used on walls in the house write that down as well. Because while the memory is infinite the recall button is not always in good working order…..
Our Habitat takes any latex as long as it’s 1/2 full, I guess it takes that to sell it. But to be honest, I’ve never had a problem with conditions or age storing latex other than freezing..and I’ve kept some for over 10 years. Well, scratch that…I have had problems with the cans rusting, though a lot of the newer ones seem to be something that isn’t metal. Skinning can be avoided by placing a layer of saran wrap over the surface of the paint in the can, beyond that, the above suggestions are all great.